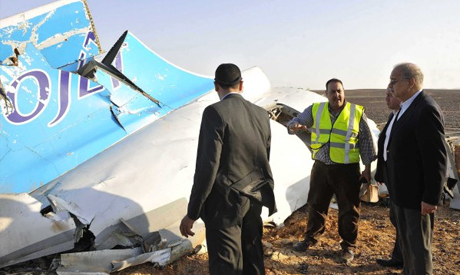 The MetroJet Disaster was No Accident. 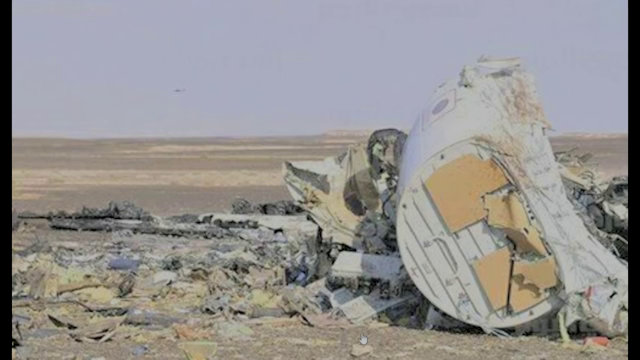 Someone targeted the Metro-Jet Flight 7K9268. 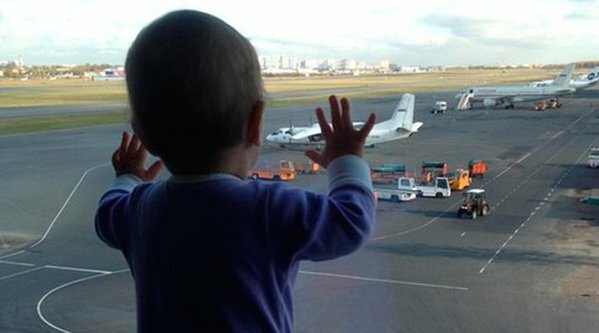 A month to the day after Russia entered the Syrian war in a big way, a Russian Aircraft carrying almost entirely Russian tourists is destroyed in the skies adjoining Israel. What an unhappy ”coincidence”. 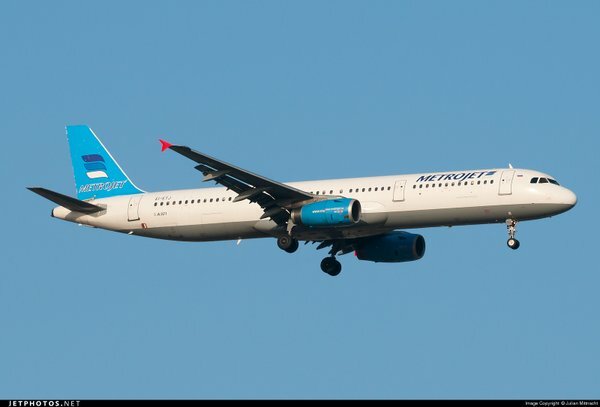 It has become clear that someone has targeted the MetroJet Flight 7K9268 that was destroyed in Egypt yesterday leaving all 217 passengers and 7 crew aboard dead. 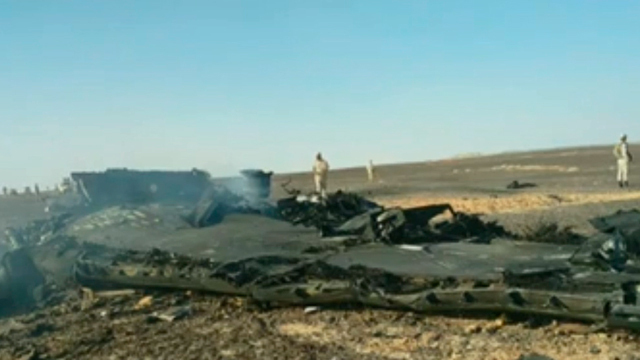 This statement can be made at this early stage in the investigation because it has become clear that the jet downed in Egypt has split into at least two pieces and there is really no way that the flight breaking up i the air is consistent with an accident. Not all of the bodies have been recovered yet. The people on the ground are still searching for the dead. In a conventional mechanical failure accident the fuselage lands on the ground in one piece and although there has been at least one air disaster ascribed to a plane disintegrating in mid air, the China Airlines 611 incident of 2002 that left 225 dead, even a freak occurrence such as this would not account for the lack of a distress call from the pilot of the doomed Metro-Jet flight.. The lack of a distress call has been a repeated across several of the recent inexplicable air disasters. The Air Asia 8501 disaster late last year is one that comes to mind immediately. There was never any explanation as to why the pilots never transmitted a distress signal as the plane apparently stalled and fell to the ocean. 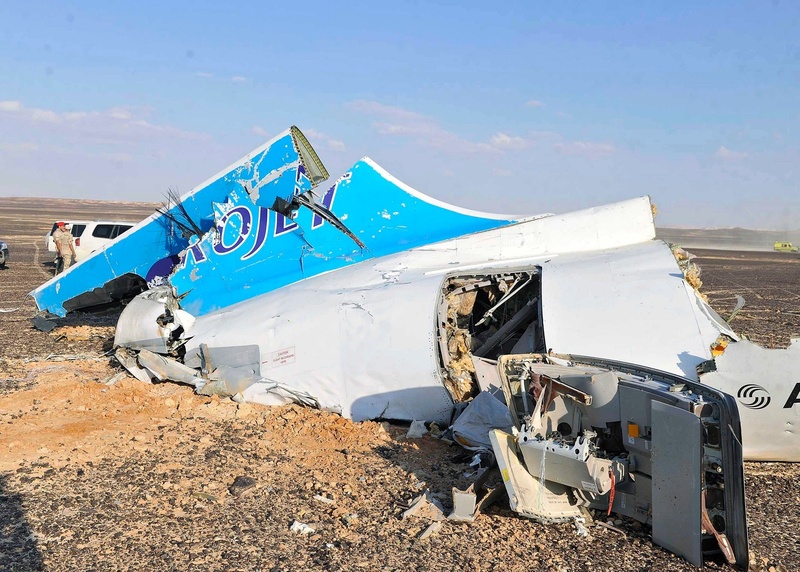 “EL-HASANA, Egypt: Egyptian rescue teams were looking Sunday for more victims of a Russian passenger plane crash in Sinai, widening the search after finding bodies scattered across eight square kilometers a day after the incident. That single story, printed in a pro-Western news organ, the Daily Star makes it clear that someone has done this. 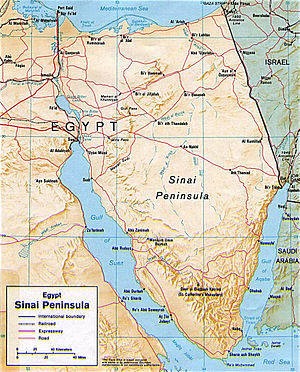 Mechanical failure will cause the plane to be unable to fly, it will not cause the distribution of the wreckage over a large area as we are seeing in Sinai. 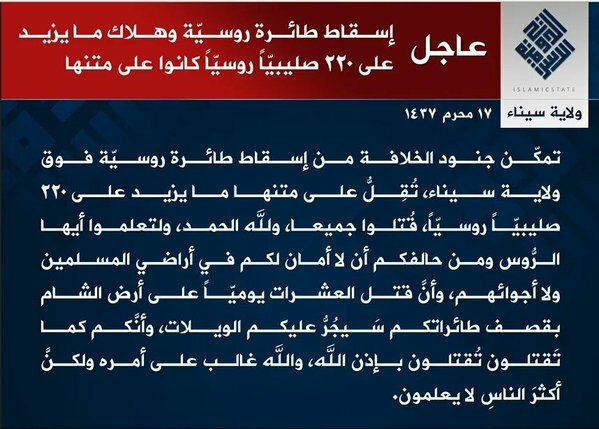 Once it is accepted that this was not an accident but an intended attack, then the obvious motive becomes clear. Either someone is upset over the month-long Russian operation in Syria and they are expressing their displeasure, or someone is trying to frame someone for that.. The message would appear to be that there will now be attacks on Russian interests right across the world and there is nothing Russia can do about it except continue what they are doing in Syria and try to even up at a later date if they can identify the perpetrators. 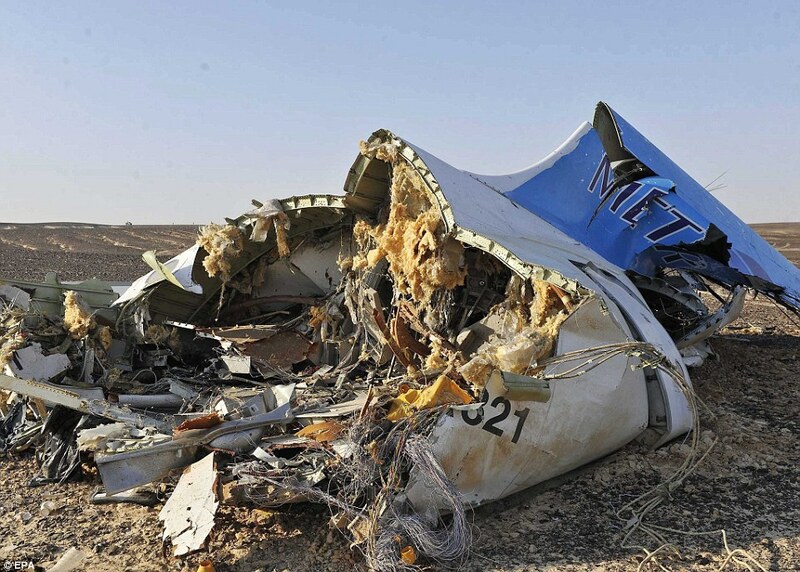 It is quite unlikely that any ground anti-aircraft system was responsible for the destruction of MetroJet 7K9268, the height of the jet and the topography of the Sinai would make it seemingly impossible to hide a system of the required size in that area. The prime methods would be appear to be either a remote hijacking, a bomb or an attack from a jet. At this early stage the remote hijacking seems to be a non-starter as it fails to explain the mid-air destruction of the fuselage. The most likely explanation seems to be either a bomb on board, an air to air attack or something exotic. Apocalypse in the Conventional Sense. It is equally becoming clear that whether by accident or design, events are poised to spin out of all control in the near to mid-term future. It seems that an immense deadly war that dwarfs the current small-scale catastrophes is poised to break out. The forces of darkness and evil cannot and will never accept that they have been usurped and are no longer the masters of the universe. Russia has too much pride to back down in the face of their threats. The tactics that work against other merely inflame the Russians and add to their determination and animus towards the authors of evil. Their mindset is calculating and methodical but there is an element of the Howard Beale character from Network, they have had enough and they are not going to take it anymore and this has been their position since the Ukraine coup of late February 2014. Since February 2014 Russian officials have stated repeatedly that they are willing to fight a major nuclear war with the West if necessary. The people who made those statements probably naively assumed it would never come to that. Since that time Russia has made a number of devastating moves, they have humiliated the demonic entities who run and control the West repeatedly. In Crimea, in Eastern Ukraine and now in Syria. 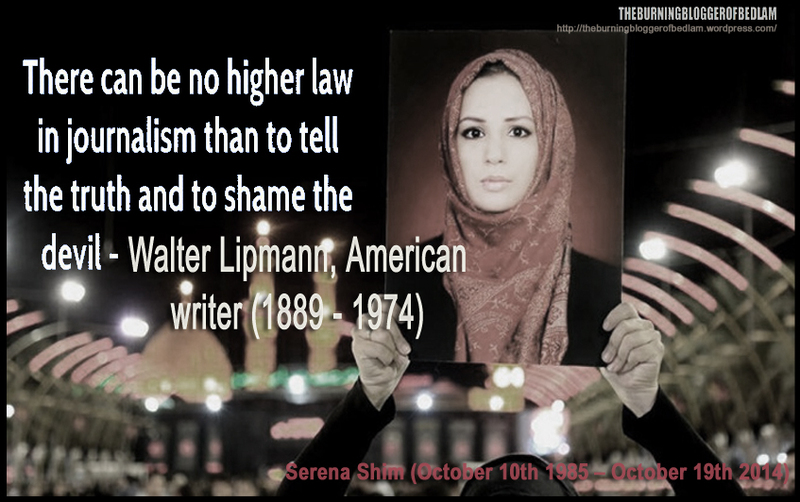 These people believe they have the divine right to rule the world, they were never going to just sit back and take it. They have met their nemesis and this is only the beginning of the response and many more families will be grieving before this is over. 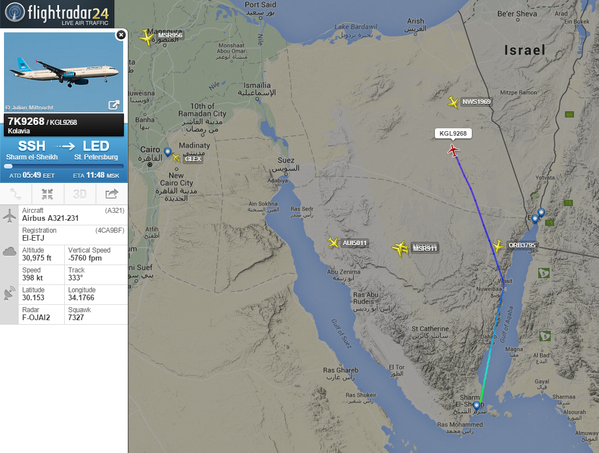 Image from Flight Radar 24 shows the flight path of MetroJet 7K9268. (Source) Thanks to silver palomino 2013 for the link. The wreckage from this flight seems more like the wreckage from a bomb attack or rocket than the Lockerbie crash or the MH17 crash. The distribution of wreckage seems wider and the destruction of the plane seems greater than either of these known rocket and bomb cases.